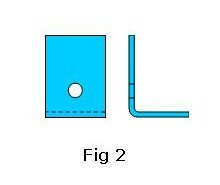 If a hole is drilled or CNC punched too close to a bend in a sheet metal component it can take on a tear drop or “pulled” form. 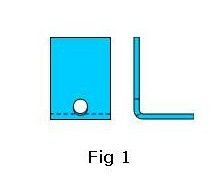 In Figure 1 below you can see a hole that has been pulled by the action of the bend that is too near to it. This may not be a problem if the hole is a simply for clearance in the sheet metal such as for a screw or bolt but would certainly be no good if the hole had to be tapped accurately with a thread. The hole position would either have to be moved away from the bend in the sheet metal or drilled out after the bend has taken place which is always a more costly and time consuming option. There are 2 formulas that can be used to define whether a a pre-pierced or drilled hole will fall into the bending deformation zone when the sheet metal component is being bent. Figure 2 shows a hole correctly placed outside the bending deformation zone. Form height compared to sheet metal thickness, an approximate ratio. 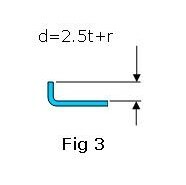 We can produce a smaller distance (d) by secondary post bend operations such as machining the sheet metal down to a given size but this will be a costly process. Some tooling can produce tighter bend rads which can reduce the bend height. To be sure of your design options please take a look at our CNC bending tooling tables, if you are still not sure please contact us and we talk through your specific needs.